Learn how to look at winter in a whole new way at this workshop, given by Spain’s only Certified Wim Hof Method Instructor, Luke Wills. In this 1 day workshop you will learn how to practice and apply the three pillars of the Wim Hof Method: Breathing, Mindset/Focus and Gradual Cold Adaptation. The breathing technique brings us into the present moment, calms the mind and optimizes the body’s chemistry. The cold reconnects us to our natural environment and awakens our true human potential for optimal health. The mindset and focus is the foundation of the other two: both cold exposure and conscious breathing require patience and dedication in order to be fully mastered. Armed with focus and determination, we are ready to explore and eventually master our own body and mind. We will do two breathing sessions. The first session will be a short session to learn the proper breathing technique of the method. The second session will allow us to go deeper, being carried by the group energy and dropping into the full experience of the power breathing. We will learn about the benefits of adapting to and exposing the body to cold and how to adapt to the cold in a safe and gradual manner. We will show you how to prepare mentally for the cold and then we will immerse ourselves in it. We will experience the intensity of an ice bath (around 5 degrees). 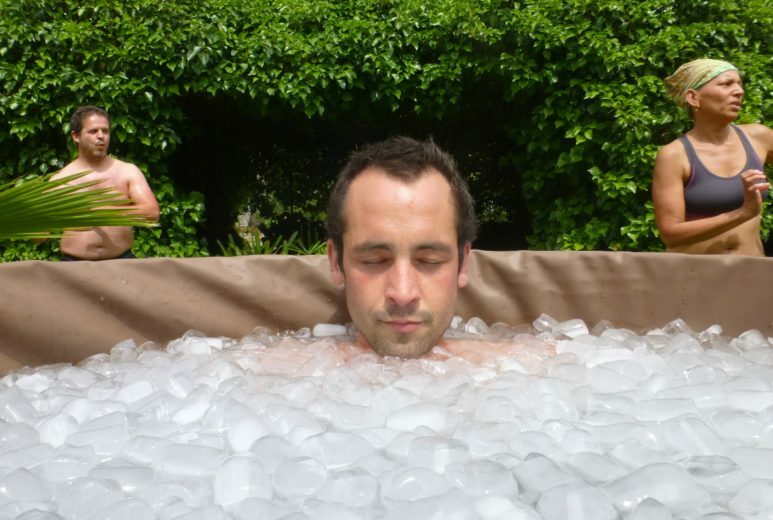 The Ice bath will be anywhere from 30 seconds to 2 minutes dictated by how you are feeling. Please bring something to share with the group for a picnic lunch. This includes a 32 page Ebook about the history, science and application of the Wim Hof Method and how the method can have a positive impact on various health conditions such as auto-immune diseases (Crohn’s disease, rheumatoid arthritis, ulcerative colitis), weight loss and depression. Places are very limited – by completing this form you are confirming your attendance and any cancellations must be made at least 5 days in advance.